I’ve not had the D4 long but thought I’d share a few initial thoughts and comparisons between it and the D3s that have stood out for me so far, talking about the ergonomics, a couple of viewfinder changes, a quick high ISO test against the D3s (with RAW file downloads) and more. I’ll also point out a couple of negatives (or, oddities) too. But please remember, this is just a brief initial review and first impression of the D4 based on having only taken delivery of the camera a week or so ago from the top chaps at Clifton Cameras. I’ll be talking more in depth about it, and various aspects of it, as I spend more time using it. I’ve also got a week long trip to photograph wildlife in Belarus planned at the end of April, so once I’m back from that and have really used the camera extensively, I’ll do a more thorough review. But in the meantime, let’s kick this off! Finally, after a delayed release, low supply and not to mention a sudden price jump (which I thankfully avoided!) the D4 is here. Everything about it feels a more refined and modern compared to the D3s, which now feels a little boxy and dated in the hand (in my opinion at least). The D3 series body was always very nice to use, but the D4 brings it up a level in terms of ergonomics, styling and attention to detail. It sits in the hand perfectly, well, almost perfectly…I don’t have the biggest hands and the beefier front grip means I actually find it a tiny bit of a stretch pushing the AF-On button when holding the camera as it naturally falls in my hand. Furthermore, the new dedicated video record button means the Mode select button has been pushed across further on the top of the camera, so I can’t naturally press it any more. The new thumb grip is much better for supporting the weight of camera in portrait orientation though, compared to the more simple contoured design of the D3 series of bodies. Equally, the new thumb sticks which make focus point selection easier in portrait are very welcome. We’ve also lost the matrix metering mode selector from it’s old home which was on the side the prism housing. It can now be found in it’s new home on the top of the mode select dial. Although only minimally lighter at around 100g in weight reduction, I found it noticeable as soon as I picked it up, in fact I noticed it way back in January when I had a hands on with it a Nikon HQ. The D4 does feel very solid though, with one exception. the battery chamber cover feels a little more fragile and not as solid as my D3s as it shows a little play even when it’s locked in place. It’s not a huge amount, but it’s not rock solid. I’ve had a couple of emails now from other D4 owners who have noticed the same thing, and one has been told by NPS UK that it’s normal. My fear was that with a little play water could potentially get past the rubber seal but that’s probably just me being over worried because it’s new. Fingers now firmly crossed I don’t post a follow up article about how my beloved D4 had a short circuit from water getting in to the battery area (note to self, even though I love this camera, maybe don’t take it in the shower with me, just to be on the safe side). Mentioning the AF-On button earlier, it now activates VR and that can’t be toggled off. Hopefully this will be fixed in a firmware update to be toggled on and off, but as it currently stands at the time of writing, using the AF-On button to focus also activates VR, which in previous cameras it has not. Hopefully fixable by way of a firmware update though. Auto ISO can be turned off by holding the ISO button and turning the front command dial. Brilliant! The lower capacity battery, so far, doesn’t seem to be anywhere near as good as my D3s. In continuous shooting it is supposed to give you more images per charge, but if you are leaving the camera idle, it’ll run out faster. With wildlife photography there are huge periods of down time where not much happens and so far, that seems to have a quite noticeable impact on battery life. After approx 400 shots and less than 2 minutes of 1080p video, I had about 64% battery left. That seems quite low. I’ll be keeping an eye on this. Of course, the inclusion of dual card formats may be bothersome for some, in fact if it wasn’t for the free XQD card and reader that Nikon bundled with the first few D4’s I’m not sure I’d have invested in XQD just yet. Now I have it though, it’s my main card. More so on the reason why further below. All the main buttons are a marginally smaller on the D4 compared to the D3s. Not big deal, but I prefer the slightly larger D3s ones. Oddly, Exposure Compensation is the wrong way round by default. On the LCD screen on the top of the camera, the – and + exposure compensation markers are the opposite way round to the D3s and any other recent Nikon DSLR. Thankfully you can swap it back in the menus though, so it’s not a big deal, but seems strange to reverse them compared to other models and I must admit it confused me briefly at first! Pros: In general, much better ergonomics and control layout changes. Slightly lighter (every little helps). Cons: Battery chamber doesn’t feel quite as solid as the D3s. Battery life isn’t as good for my type of use. Dual memory card formats isn’t ideal (but I feel necessary to ease us in to it). AF-On also activates VR and that can’t be toggled off – hopefully fixed with firmware update. The viewfinder has had some nice upgrades with the way it feeds information back to you. The first is by way of a grid which can now be turned on and off. Finally! I really did miss this on the D3s so it is very welcome to have this on a pro series body (I forget if my D2x had one?). But the viewfinder information feedback doesn’t stop there. I find myself peering through the viewfinder in some very awkward positions at times depending on what I’m shooting and how I have to position the camera on the ground to do so, making wonky horizons an occasional occurrence, especially with birds on the water. But no more with the grid! Focus modes are now easily selectable and clearly marked out in the view finder as you switch between them all. Not only do you get a little readout at the bottom of the viewfinder telling you which mode you are selecting, but the focus points very cleverly change style as you do so to give you an even clearer indication whilst you are using the camera. In single point mode it’s business as usual, but switching to 9 point, the main focus point lights up, and is surrounded by eight dots (the main focus point being the ninth) which follow the main focus point around the screen as you reposition. The same happens for 21 and 51 point dynamic focus, with more little satellite dots appearing so you can clearly see what mode you are in and have an idea what coverage the grouped focus points are getting you. With the D3s, this was all achieved by way of a switch on the back of the camera and either diving in to the menus or setting up the front function button. Now we have one simple button. So far, I like it. Some may miss the focus mode selection switch that was on the D3s, but I certainly don’t and find it much more intuitive to switch between all focus modes now. The improved virtual horizon or spirit level has changed how it now feeds you back information in the viewfinder too. In the D3s it used the exposure meter at the side of the screen to indicate if the camera was level, but now with the D4 detecting for both pitch and roll, something needed to be changed. Yep, you guessed it, the focus points come in to play again and with the D4 they detect the roll and the exposure meter detects the pitch. Again, a very clever use of the focus points within the viewfinder and it makes for a much more user friendly experience. The D4 is FAST! The shutter feels way more responsive than the D3s, and when you combine the massive buffer and ridiculous write speeds of the XQD card, the amount of RAW images you can take, and the speed it clears them, it is phenomenal! The XQD card writes images from buffer to card at roughly three images a second I’d guess. 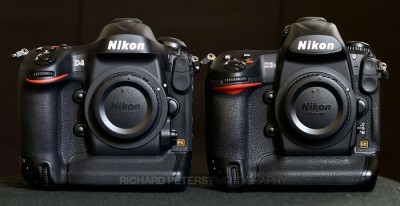 The D3s (which was quick) feels like a slouch up against it’s replacement. EDIT: It will actually clear over 70 RAW files in under 20 seconds, which I’ve made a video demonstrating. Thanks to the improved optics on the focus sensor, the D4 now auto focuses down to -2EV compared to -1EV on the D3s. As a result we now have autofocus on f8 lenses making those up us who shoot with telephotos and teleconverters much happier. Initial shooting with the 600 VR + 1.4x TC certainly seem to show less tendency to hunt when using the outer focus points compared to similar conditions with the older camera. I’ve yet to fully test various converters with both my 200-400 and 600 VR but will do so in due course. Already though, it’s clear this is a big improvement. Focus point can now also be remembered between horizontal and portrait orientation, so it will flip to the last previous focus point used for each orientation if you turn the feature on. This wasn’t an option on the D3s and whilst I like it, I think they should have also included the Canon 1DX implementation of this, where by as you switch between orientations, the focus point tries to remain constant e.g. if you have the third focus point up from the centre selected in horizontal orientation, when switching to portrait, the focus point automatically switches to what is now the third one up from centre in vertical. Pros: Improved focus in low light and with teleconverters. Buffer is massive! XQD card is crazy fast at clearing buffer. Apart from the fact it’s hugely improved over the D3s, there are some really cool little features thrown in too. One that issue that always bugged me on the D3s (and part of the reason I shot little video) was the camera couldn’t save independent exposure settings for video and stills, and the the two different modes rarely, if ever, require the same exposure for the same scene. But now you can set independent exposure settings for video and stills. No more annoyance of having to adjust exposure settings back and forth constantly. I’ve not had time to do any real comparisons, and indeed there are already a few good ones online so I may not even do a more thorough one. But for now here’s a quick sample shot taken with both the D4 and the D3s to compare the high ISO. The image is taken at ISO 12800 with the camera locked off via the lens collar of my Sigma 150mm – this allowed me to keep the framing identical as I swapped the bodies over. If you want to compare better, below you can download the both the original RAW file from the ISO 12800 image for both the D4 and the D3s, plus the tiff I converted the RAW file to. The D4 file probably still has that sneaky small amount of NR switched on, so be sure to turn that off if you are using Nikon View or Capture NX to read them. All settings on the two cameras were identical, set to manual exposure of 1 second at f2.8, ISO 12800, 4k white balance on both and sharpening set to 3 in camera. Interestingly, despite the same settings the D4 looks better exposed and with more pleasing colour compared to the slightly darker and more orange toned D3s image. The D4 image also had noise reduction set to 3 when opened in Capture NX (despite being off in camera) so I put that back to zero to make it fair. Based on this quick test shot and my first few shots in the field, where I often use high ISO in decent light to get higher shutter speeds and more depth of field, I’m pretty much of the opinion the D4 is maybe a 1/3 stop better than the D3s in comparable ISOs. Slightly disappointing after being told there was a stop difference back in January, but we have this with more resolution and of course a lower base ISO so I certainly won’t lose any sleep over it. And here’s a real world image taken at ISO 9000, with no noise reduction. It’s good enough for me! More images from this shoot can be seen on my previous blog post here. So, there’s we have it, my quick roundup of initial thoughts of a few aspects of the D4 v the D3s. Again, as I use it more I’ll be covering more aspects of it, including the 2.7x video crop mode (wildlife photographer/videographers dream) and the WT-5 wireless transmitter. And of course, I’ll be doing my general more thorough review in due course once I’ve spent more time using it. But for now, the story so far based on the early days of ownership? If you are only interested in upgrading your D3s to a D4 for better image quality in low light, don’t bother. In all practical use, and to the casual observer they are pretty much exactly the same (bar the D4 having more resolution, and so potentially providing slightly better detailed prints). And whilst we are at it, the better focus, controls, speed improvements etc may not be of any benefit to many shooters out there either depending on their type of photography. Equally though, those new improvements will be very useful for those who’s type of photography will benefit, but only you can know that for sure. Me? I’m very pleased with the D4 but there is no denying the simple truth that the D3s is such a good camera, making it obsolete in the eyes of those who own it, might take more than the D4 can offer. Cons: It’s way more expensive. The ‘betterness’ may not be better enough for some. There is no doubt that just reading the spec sheet of the D4 doesn’t do it justice. Simply put, it is a better camera than the D3s, and I can appreciate that all the more from actually using it as opposed to only reading about it. The question is, is it better enough for you? And that, I feel, is a question with no right or wrong answer. I picked mine up from the top folks at Clifton Cameras in the UK. Of course, those in the USA may prefer to try B&H Photo Video.